Indonesia has been hit by a second tsunami in 2018, resulting in hundreds of deaths and injuries. This latest disaster, which was caused by a volcano, follows a tsunami from an earthquake in September. 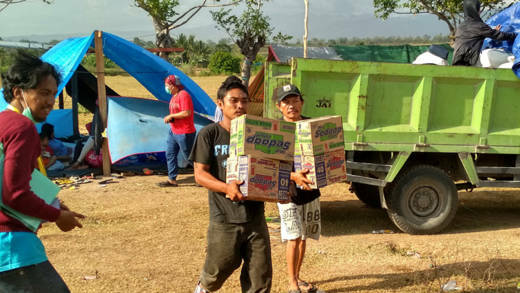 CAFOD’s Caritas aid workers on the ground in Indonesia have a wealth of experience responding to this type of disaster and are already present in two dioceses near the affected area. Six months on from the Indonesian tsunami and earthquake, CAFOD and our aid experts on the ground have been able to reach thousands of people with emergency assistance and the tools to start rebuilding their lives. Our emergency response programme targeted the most heavily affected districts of Palu, Sigi, and Donggala – and over 2,000 families received kits with essential hygiene and cooking necessities to cover basic needs and stop the spread of disease. In addition to helping families with their immediate needs, our local emergency experts gave over 1,200 people affected by the disaster cash transfers so they can begin to start rebuilding their homes and washing facilities. So far, our experts in disaster risk reduction have trained over 600 community members on how to reduce risks during a disaster and to rebuild using disaster-resistant techniques. With this training, they will be able to share knowledge and practices with their communities, so everyone can be better prepared next time a disaster strikes. Although we have been able to reach thousands of people affected by the Sulawesi disaster, in a country devastated by three emergencies last year, there is still great need with over 150,000 people unable to return home. In the next 12 months, we will support a further 15,000 people with vital humanitarian aid, which will include rebuilding houses and repairing water and sanitation facilities, including latrines. We will have provided training for over 1,000 community members, allowing them to become emergency experts and together, we will create community action plans – meaning thousands more people will be equipped when a disaster hits. Nining (25) with her youngest daughter Tiara (3) at their emergency shelter in Jono Oge, Sigi. They are one of the families that were affected by the Central Sulawesi earthquake and have received assistance from CAFOD’s aid experts on the ground. Nining, 25, was a farm worker for a water spinach farm in Jono Oge, Sigi. On the afternoon of the earthquake, Nining was travelling to work when the earthquake struck. When she arrived home, the ground had cracked open and everywhere was covered in mud. Luckily, her husband Yulius, 30, and her mother-in-law were home and guided the children to safety. They ran to higher ground, eventually arriving in a field that later became a camp. Since the disaster, Yulius, a pig farmer who sold to small restaurants, has become the sole breadwinner of the family. “Yulius still has some pigs left after the earthquake,” said Nining. “He used to have 10 pigs, but some escaped and some died. A sow had a miscarriage. After the disaster, Nining and other families in the area received help from CAFOD’s local aid agency, CRS. “I received a mosquito net, a jerry can, a bucket, toothpaste, toothbrushes, soap, shampoo, detergent, dishwashing soap, and a water pail. Central Sulawesi Indonesian tsunami, September 2018 - What happened? On 28 September 2018, a 7.5 magnitude earthquake and tsunami struck Central Sulawesi Province, Indonesia on 28 September 2018 caused more than 2,100 deaths, and over 11,000 people were seriously injured. Potentially, two million people have been affected across 85 districts, and over 220,000 displaced people are living in evacuation centres or informal camps, with many more staying with relatives or friends. Our Caritas aid workers on the ground have a wealth of experience responding to this type of disaster and are already present in two dioceses near the affected area – Makassar in South Sulawesi and Manado in North Sulawesi. They are being supported by our sister agency Catholic Relief Service (CRS) which is already addressing the immediate needs of survivors, with relief supplies, including tarps, blankets, and sleeping mats and also sanitation and clean-up kits. CAFOD supporters have already raised over £200,000 to help the communities who are most in need. “I have been horrified by the devastation of the tsunami in Indonesia. So many lives have been lost and affected by this disaster, there is so much to do. “Our local colleagues in Indonesia are doing their utmost to provide the basics – clean drinking water, food, and shelter - for people to survive over the coming days and weeks. “We are already receiving donations from the Catholic community across England and Wales. Sunda Strait tsunami – What happened? A tsunami hit the coast of Sunda Strait in Indonesia on Saturday 22 December about 21:30 local time (14:30 GMT). Reports to date say that at least 222 people have been killed and an estimated 843 injured. Around 28 people are still missing. Several of our local Church experts in the country who were already been responding to September’s earthquake and tsunami in Central Sulawesi have been deployed to respond to this disaster. They are in the two dioceses of Bogor and Tajung Karang to assess the immediate needs of vulnerable people such as shelter, food and clean and safe water. The tsunami is thought to have been caused by the eruption of Anak Krakatoa volcano, which may have triggered underwater landslides. How have people been affected by the tsunamis in Indonesia? The latest official figures from the September 2018 Indonesian tsunami report that the death toll from the disaster is at least 1,948. More than 60,000 people have been made homeless, and 200,000 people are in need of urgent life-saving aid. The Indonesian authorities are warning that thousands more people could have perished after waves of up to 20 feet hit the city of Palu- which is home to more than 300,000 people. The immediate priority was to to reach the worst affected communities, many of which were cut off by landslides and road blockages. Caritas Indonesia loading trucks up with aid outside a church, ready to be taken to Palu. How did aid get through to those most in need? There were challenges including roads that have been blocked from landslides. We received reports that Caritas aid workers are making journeys on foot where roads are blocked by debris. The Indonesian authorities worked on clearing the roads, so that aid deliveries were able to get to where they are needed most. How did CAFOD respond to the Indonesia tsunami? Caritas Indonesia preparing to distribute aid in Palu to families affected by the earthquake and tsunami. CAFOD has joined forces with the Disasters Emergency Committee to allow our Caritas colleagues to scale up their emergency response in Indonesia. So far, the DEC Indonesia tsunami appeal has raised over £23 million from UK donations to help families across the affected region. Thanks to the funds raised, we have been able to reach some of the most vulnerable families traumatised by disaster and in urgent need. In the days and weeks following the disaster, our Caritas aid workers have already been working in Palu and other affected areas to support communities – transporting 7 tonnes of rice, canned sardines, 500 boxes of drinking water, 250 packages of blankets, hygiene kits, water buckets, tarpaulins, mats and sarongs, and have begun distributions. Over the next six months, CAFOD will be working with agencies on the ground – Catholic Relief Services (CRS), Caritas Indonesia (Karina) and other local partners – to provide cash assistance to help people rebuild their homes and sanitation facilities. We are working with communities in Donggala, Palu and Sigi within Central Sulawesi, which suffered high rates of structural damage from the disaster. The project will also provide technical training on ‘Building Back Safer’ techniques to ensure people are able to build homes that can withstand future disasters. How are we coordinating our response with others? As a member of Caritas International, we are coordinating closely with other Catholic agencies to ensure that our response is as efficient and effective as possible. Caritas Indonesia has an existing network of staff and volunteers in two dioceses near the affected area - Makassar in South Sulawesi and Manado in North Sulawesi - and they are working with our Caritas colleagues, and liaising with the Indonesian government and UN agencies, to get help to those who need it most. As part of the Disasters Emergency Committee (DEC), we work together with fourteen major British aid agencies to ensure that we are not duplicating our efforts. How much of my donation goes towards administrative costs? With regard to costs, 90p in every pound donated is spent on delivering our charitable activities – 81p on overseas programmes, 9p on the support costs required to run the organisation, and 10p on fundraising. How can I help and donate to Indonesia tsunami appeal? Please give today to the Indonesia tsunami appeal. Your donation will deliver emergency items to people in need.